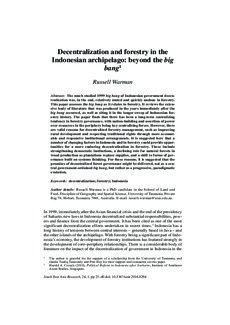 The much studied 1999 big bang of Indonesian government decentralization was, in the end, relatively muted and quickly undone in forestry. This paper assesses the big bang as it relates to forestry. It reviews the extensive body of literature that was produced in the years immediately after the big bang occurred, as well as siting it in the longer sweep of Indonesian forestry history. The paper finds that there has been a long-term centralizing tendency in forestry governance, with nation-building and assertion of power over resources in the periphery being key centralizing forces. However, there are valid reasons for decentralized forestry management, such as improving rural development and respecting traditional rights through more accountable and responsive institutional arrangements. It is suggested here that a number of changing factors in Indonesia and in forestry could provide opportunities for a more enduring decentralization in forestry. These include strengthening democratic institutions, a declining role for natural forests in wood production as plantations replace supplies, and a shift to forms of governance built on systems thinking. For these reasons, it is suggested that the promises of decentralized forest governance might be delivered, not as a central government-ordained big bang, but rather as a progressive, paradigmatic evolution.